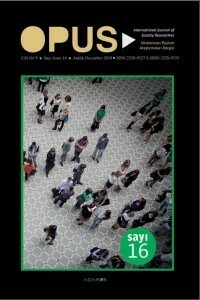 OPUS-International Journal of Society Researches is an academic, international and refereed journal which is published three a year in April, August and December and gives place to either Turkish or English articles. OPUS is society focused and set principle of publishing theoretical, applied and original articles which focus on social problems as disciplinary or interdisciplinary. In this context, it is open to all articles focus on social sciences and humanities. While OPUS welcomes all studies which will be prepared to work within different areas of expertise; education, sociology, psychology, political science, social policy, management science and it has a framework of working with field angle of the life force field / address field studies are preceded by size. Tutelary Regime of Single-Party Period: Segue or Impediment to Democracy? Kazakistan’da Değişim ve Dönüşüm: Yeni Bir Uluslaştırma “Başarısı” mı?